Sometimes kids say the darndest things. When I pick Nathan up from school, we all drive through the front and a teacher walks them out and helps them get into the car. When I picked Nathan up yesterday, the teacher was helping him into his carseat and Nathan asked if Daddy was home. Through fits of laughter, the teacher told me that they’ve learned to not believe anything the kids tell them since they say the most bizzare things. Thank goodness she understands because that might have been a little awkward trying to explain to her that we do indeed wear clothes. In other news, Nathan had his first ear infection ever. Nathan was fine when I dropped him off at school on Thursday, other than a residual runny nose and cough from a lingering cold. However, when I picked him up from school that day, l could tell something was very wrong. He was crying and holding his little ear, tears streaming down his face like miniature waterfalls. The teacher who brought him out told me he’d been complaining about his ear hurting that day, but it had apparently gotten worse in the last hour or so. I asked Nathan where he hurt, and he said (obviously) that it was his ear. I asked him if he put anything inside his ear and he said a balloon popped in his ear. Since he’s on the tail end of a nasty cold, I was worried about either an ear infection or a busted ear drum since he said a balloon popped in his ear. Nathan was screaming and crying so hard that he couldn’t talk, so I immediately called his doctor. I know I’ve said this before, but I have to say it again- I LOVE their pediatrician. When I told the receptionist what was going on, she asked how soon I could be there and I said five minutes. We get there and waited only long enough for me to take Nathan’s coat off before we were called back. Nathan was screaming the whole time and his ear was bright red. He was so pitiful, in fact, that everyone we came across at the doctor’s office tried to offer him words of consolation. “Poor buddy, don’t worry we’ll get that ear taken care of,” “Aw bless him,” “It’s okay little man, we’re going to help you,” among other sweet things. The doctor took one look at his ear and confirmed it was an ear infection. And while he was looking at his ear, Nathan asked the doctor to get the balloon out. Fortunately, there were no balloon pieces in there. Nathan’s ear drum was bulging from the ear infection, however, but the doctor said since we caught it so early, he was going to be just fine. Administering the numbing drops was another story. They know about his sensory issues, and bless them for being so accomodating. The nurse explained to Nathan exactly what she was going to do and what it would feel like, but he still panicked once she put them in. See, his brain processes sensory information differently than that of a typical person. Sensory input (such as the wind in our hair, textures, sounds, etc.) that may be annoying or even pleasant for us can be excruciating for him. Even showers are painful for him. Because of his autim, he doesn’t (or can’t) tell us how it feels, but judging from his reaction, I suspect it feels like needles jabbing at his skin. So anyway, the feeling of the cold medicine dripping into his ear caused him to start shrieking and flopping around, but the nurse handled it perfectly. Ironically enough, he really enjoyed having the cotton in his ear, and even asked for another piece when the first one fell out. He was still reeling from the drops when the doctor returned with the prescription, but he was able to calm Nathan down and even solicited a laugh or two by giving high-fives and “missing” a few of them. After the numbing drops and some ibuprofen, we left to drop of a prescription for antibiotics. 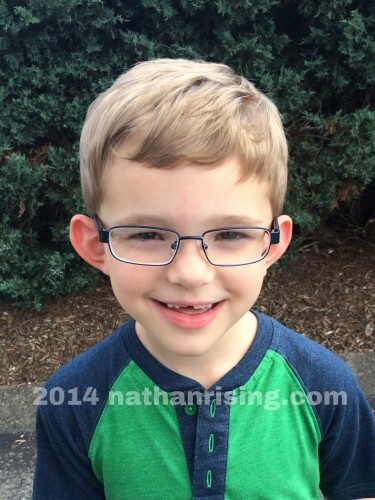 After further questioning in the car, Nathan said the balloon popped by his ear at home. I remember that- it happened a week or so ago. When it happened, I remember telling Nathan that we have to be very careful with balloons next time because having them pop by our ears can cause ear pain among other problems. So apparently when his ear started hurting, he thought it was because of the balloon popping. My sweet boy. Nathan’s on the mend now and back to his old self. I hated seeing him in such pain. This is his first ear infection ever- and after seeing firsthand what kind of pain it causes, my heart really goes out to kids who suffer from numerous ear infections. Sweet Nathan. I’m glad I got him in when I did before it got worse! And I hope he doesn’t have to deal with something like that any time soon! Whew! 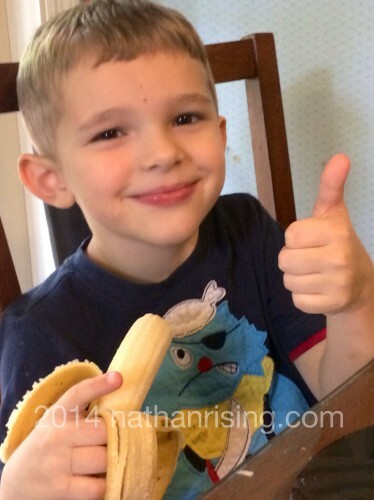 Nathan got over his strep throat pretty quickly. Of course, he’s still on antibiotics and will have to be on them for a total of ten days, and I’m thankful that it wasn’t as bad as it could have been. My mom told me that my brother and I had strep throat constantly as kids. And then she would get it and we’d all just keep passing it around. Thankfully, no one else in our house caught it! I hate, hate, HATE having a sore throat. I was gargling with salt water twice a day, hoping to prevent myself from catching it. Seems to have worked! In other news, I made my first batch of homemade baby food today. Peas! I took a small bag of frozen peas, boiled them in 1/3 cup of water for 5-6 minutes, and pureed them in a baby-food puree thingy we have. I know that sounds funny, but I don’t know exactly what it’s called. It’s not really a blender, not a food processor. We got it at a baby store, specifically to make baby food. Actually, we got it when Nathan was a baby but just never used it! Glad I’m finally putting it to some use. So anyway, after I put the peas in the puree/blender thingy, I added the water I boiled the peas in. This is because many of the nutrients from the peas are seep into the water. For babies less than 7 months old, dowever, you can’t always use the water you boiled the veggies in because some of them, like carrots, have nitrates in them. Peas are fine to do that with, though. Then I added some pumped milk and a little filtered water since the peas were still a bit too thick for John. I refrigerated enough for a couple days and put the rest in the freezer. 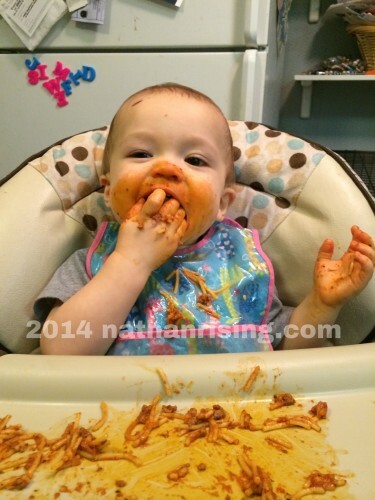 It made a total of about 12 oz of baby food. Not bad, huh? Cheaper than buying that processed, store-bought stuff. And I KNOW what went into it, so that’s a huge plus. Now let’s just hope Mr. John likes them, too. Speaking of which, he just woke up from his nap, so I’m going to go steal some snuggles.